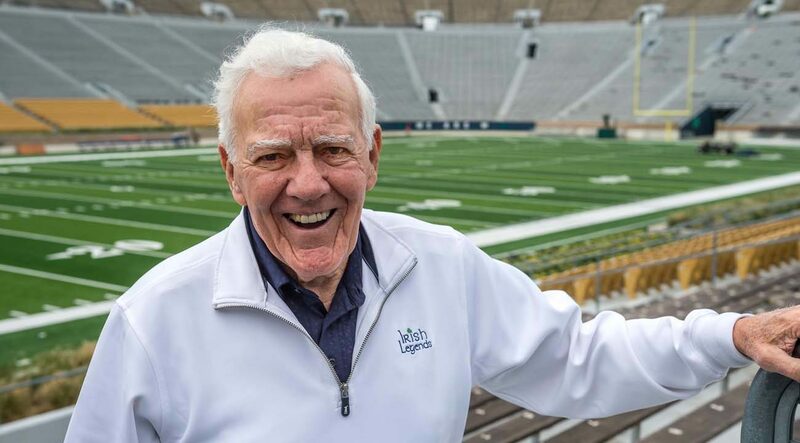 ST. PAUL, Minn. (CNS) — Though not a Catholic himself, legendary University of Notre Dame football coach Ara Parseghian had a notable respect for the school’s Catholic faith as well as the Fighting Irish’s gridiron tradition. Parseghian died Aug. 2 at age 94. He led the Irish in the 1960s and 1970s to a 95-17-4 record and national titles in 1966 and 1973. He posted winning seasons in all 11 years, which included five major bowl game wins with the Catholic university in South Bend, Indiana. An afternoon Mass to celebrate the life of Parseghian was to be celebrated Aug. 6, the feast of the Transfiguration, at the Basilica of the Sacred Heart at the University of Notre Dame with the university’s president, Holy Cross Father John I. Jenkins, as the main celebrant. Following Mass, family members and former players and colleagues of the late coach were to speak at memorial celebration at Purcell Pavilion at the Joyce Center. Academic standards remained high during Parseghian’s tenure, something many powerhouse college football programs skirted in the second half of the 1900s to get top talent on the field. A secondary priority turned out well in returning Notre Dame to gridiron glory. The Irish won their first national title since 1949. 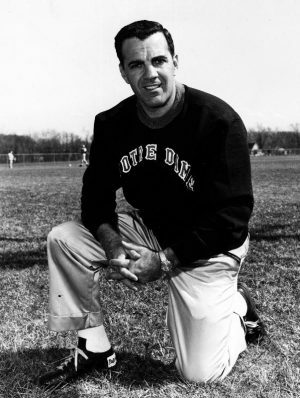 Parseghian arrived after the Irish’s 2-7 season in 1963. It didn’t look any prettier before that with three 5-5 seasons since 1959 and a 2-8 mark in 1960. Parseghian had a solid run, 36-35-1, with a non-powerhouse program at Northwestern University in Evanston, Illinois, for eight seasons before joining the Irish. He coached the Irish to a pair of unbeaten seasons in the national title years, and his teams never lost more than three games in the season. They won two Cotton Bowls, two Orange Bowls and one Sugar Bowl in his tenure. Putting academics first didn’t slow down individual success for players either. Pro Football Hall of Famers he coached include Alan Page, Dave Casper and Joe Montana. Parseghian also coached 1964 Heisman Trophy winner John Huarte. The late coach also worked with the player known as “Rudy,” Dan Ruettiger, in 1974. Besides maintaining academic expectations, Parseghian provided opportunities for players to engage in the Catholic faith. The team stayed at Moreau Seminary at Notre Dame the night before home games, which began during Parseghian’s first season in 1964. All Irish players attended Mass and received blessed medals the next morning, according to the National Catholic Register. Parseghian’s Irish went unbeaten at Notre Dame Stadium in four of his 11 seasons at the helm. He retired at 51 and lived in South Bend his remaining years. In 1980, he was inducted into the College Football Hall of Fame. Ara Raoul Parseghian was born May 21, 1923, in Akron, Ohio. He enrolled at the University of Akron after playing high school football. Parseghian quit to enlist in the U.S. Navy during World War II. After serving for two years, he attended Miami University in Ohio, then went on to play halfback for pro football’s Cleveland Browns. While with the team, the Browns won All-America Football Conference championships in 1948 and 1949. A hip injury ended Parseghian’s pro career. He is survived by his wife of 69 years, Kathleen; two children, Kris Humbert and Mike Parseghian; and a grandson. The couple’s daughter Karan died in 2012 of complications from multiple sclerosis.